IQ-600 - Earthquake Sound Corp. 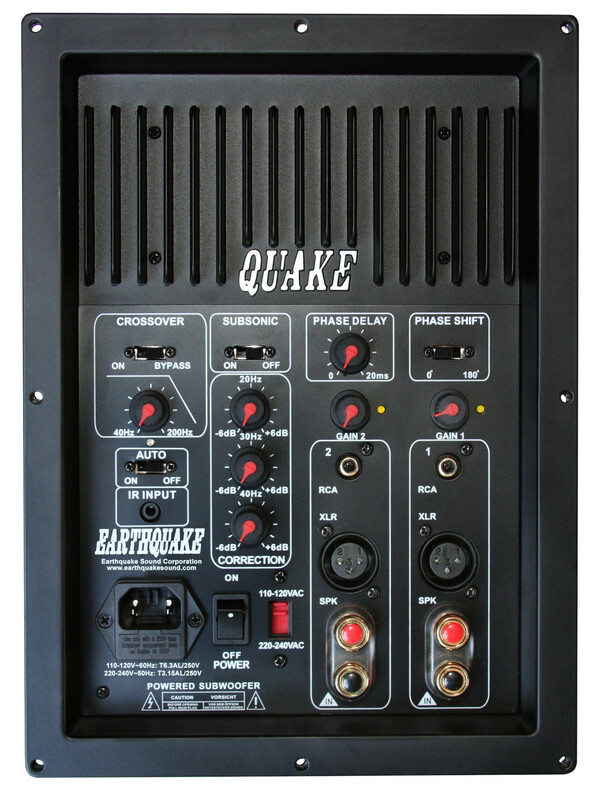 This powerful 600 Watt amplifier is used in our strongest subwoofer, the MKVI. Now it is available for custom installers to build their own enclosure. The IQ-600 comes complete with a transformer, remote, and remote eye. IQ-600 allows the user to time align the subwoofer output with the rest of the system. Front speaker frequency response extends down to 50 or even 40 Hz; this is well within the frequency response of most subwoofers. If the LCR (left front, center front, right front) were to be offset in time with the subwoofer, some of the low frequencies will be canceled and some will multiply. To be true to the music, Earthquake Engineers did not want to just Equalize the frequency response using an equalizer because it would mask the problem, not solve it. To solve it, Earthquake uses a patented phase adjustment technique that allows the users to flip the phase between 0 and 180 (no group delay is added). For additional final fine tuning, there is an in-line variable delay circuit to fully optimize the response. Single band room EQ offers no solution for room equalization and is an old fashioned bass boost. An IQ-600 room EQ offers local boost or cuts that will actually smooth out peaks and dips in the response, leaving it flat. IQ-600 also provides a subsonic filter that is switchable with a high pass at 20Hz. The user can boost 30Hz and 20Hz to move the subsonic center frequency to a lower or even higher value. This amplifier is a true custom tool for custom installers.